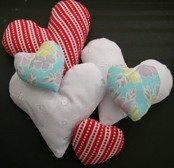 Make some Heart cushions, another different shape to use. 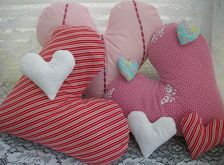 Heart cushions!!! What a great way to make a statement about the look you are trying to get. These a great to use in your bedroom but why not bring them into your living room or lounge. They will certainly be the talking point. Make your room really feminine by having these shaped cushions on your settee or sofa. Two definitions of the word heart in the dictionary are "the (imagined) seat of affections, understanding and thought" and " term of endearment or encouragement". Making a pattern can be a bit tricky. Whether you make the "V" shape deep or just barely there is your choice. If you get half of the shape looking good then this is all that you will need as it can be placed on the fold of the fabric and that way both of the points should be the same shape. The type of fastenings for this shaped cushions can vary depending on the look you are going for. If the fastening is going to be concealed then down the middle of the back of the cushion is the best place and a zip or velcro can be put in the seam. You may find that you would like the fastening on show and be part of the design of the cushion. The making of the cushion could then be turned around so that the two back pieces become the front to have either ribbons or buttons on show. Fastenings are not really needed at all if you are going to wash the whole cushion. Then you will just need two full heart pieces sew all around the seams leaving a gap for the filling and the slip stitch closed. This way would be best for smaller ones or for ones that are not going to be used a lot. Hearts can be made in any size. Try making lots of smaller ones as these can be used as hanging decorations.This shape of cushion is quite apt to have as a wedding ring bearer cushion. As what can be more romantic than your wedding. Please take care with any soft furnishing that it does not come into contact with any heat source. If you have found an error on this page or want some more information on sewing cushions. Hook and loop fastening is great to use in cushion covers. Another versatile fastening is Velcro which is a hook and loop fastening and can be used in place of zips. Finding knitting patterns to make items for you and the home. There are many knitting patterns available to help you make simple and complicated items. Finding sewing patterns for things to make, for yourself and the home. Making things for your home or yourself can seem daunting but there are lots of sewing patterns to help you get started in the design you want. Copyright © 2010 - 2019 cushionsandmore.com. All rights reserved.